How to Make a Great Wine: Step #1. 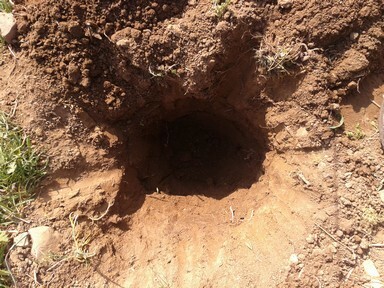 60 cm (24 inch) deep hole ready for planting a new wine plant. As you may have guessed, I am a firm believer that a great wine starts in the vineyard. Of course one may argue that the actual first step in creating a great wine should be site selection (i.e. finding the best possible place to dig a hole), and then variety and clone choice (i.e. what to plant into your freshly dug hole). There is of course a point to that argument, and others may certainly hold to different standards and ideas. But as for myself, I see the related processes of site and variety selection as more of a set of required conceptual prerequisites that lead up to the actual start of wine making: which begins in earnest when the land is prepared and the first vine goes into the ground. Of course, digging holes is a lot of work, even when using machinery. The common PTO auger post hole diggers should make quick work of planting. But being on the slope of an extinct (we hope) volcano it becomes inevitable that the rocks in the soil instead make quick work of the auger. 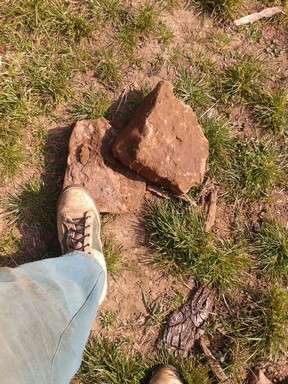 Rocks of all sizes are encountered when digging holes for planting wine. Thus, given the embedded nature of stones in the soil I have found it usually more convenient, when planting a few dozen to a few hundred vines, to resort to either a shovel or a backhoe, respectfully. 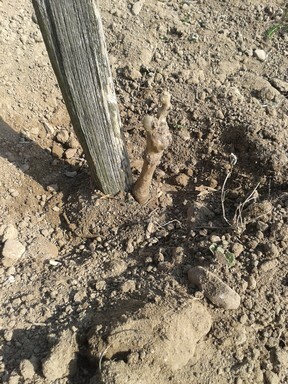 After that, planting the young vines is rather straight forward. All the vines we plant are grafted. They were pre-soaked for a few hours before planting and the root were trimmed to 15-20 cm. Trimmed vine roots ready for planting. A stake of American Locust, the same wood we use for heating, is hammered into the hole before planting the vine, and then the vine is placed in the hole and the hole is filled in, leaving just a slight depression to catch rain. Water wise, we pretty much let the vines fend for themselves at this point unless the new vines show signs of water stress, which is rare especially for vines planted in the fall. The prior winter’s rain and snow normally charges the soil with enough moisture to allow the vine to be sustained through the spring, and then spring and summer rains also contribute. 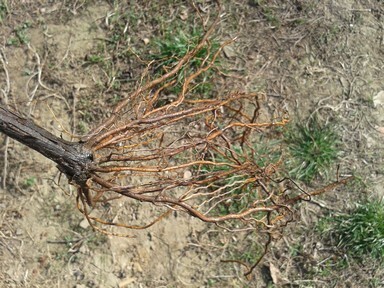 Spring planted vines may require some minor irrigation during the summer depending on the rains that year. Our adult vines are never irrigated; they simply don’t need it. Which is a good thing since, contrary to de facto irrigation installed in most wine growing regions of the world, it is not allowed to irrigate adult vines in Hungary (or in many part of Europe for that matter). Without needing irrigation Hungarian wines may justifiably claim they are just possibly a wee bit more “green” than some others.